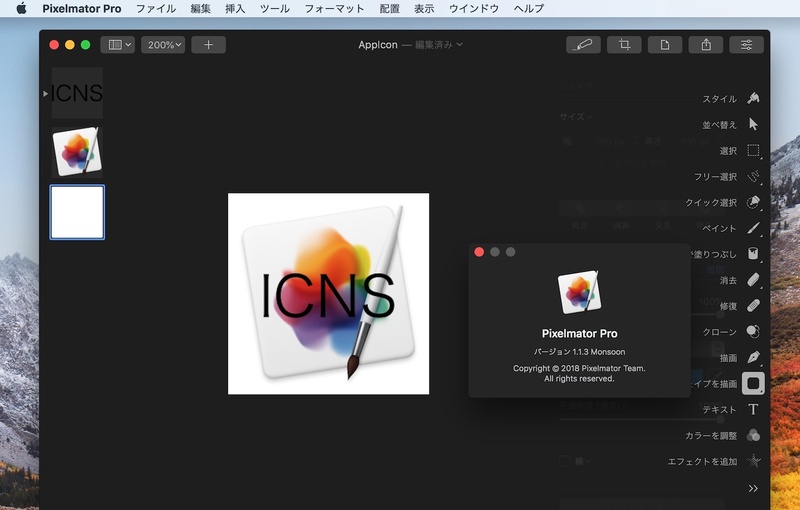 EXRやPBM、ICNSファイルなどの読み込みをサポートし複数の不具合を修正した「Pixelmator Pro v1.1.3 Monsoon」がリリース。 | AAPL Ch. Pixelmator Pro 1.1.3 adds the ability to convert selections into shapes, brings support for opening a few more exotic image formats, and includes a number of bug fixes, performance, and stability improvements. You can now convert selections into vector shapes. Added support for opening a number of more exotic image formats — EXR, PBM, ICNS, Radiance HDR, texture formats such as PVRTC, ASTC, and KTX. Converting speech bubbles with longer tails from shapes into pixels would clip the end of the tails. Fixed. When changing the size of an image, using Percent as the unit would not be remembered. Fixed. The New Image window would be slow to open with lots of items or a very large image in the clipboard. Fixed. When undoing certain actions, layer thumbnails would occasionally not be updated correctly. Fixed. When flattening certain effects in the Blur and Tile categories, the new image would shift slightly. Fixed. Pixelmator Pro was a little slow to open on Mac computers with large font libraries. Fixed. It was possible to select unsupported image formats with the Image fill effect even though they would not work. Fixed. In certain cases, temporarily switching to the Arrange tool while painting would cause the tool to get stuck. Fixed. RAW images will now be imported with the PPI set to 300. The accuracy of the White Balance, Curves, and Levels color pickers has been improved. In wide color images, using the Repair tool and painting on an empty layer with Sample All Layers on would paint with transparency. Fixed. When editing multiple Pixelmator Pro documents and choosing Show Info Bar, Show Guides, and Show Grid in one document, those options in the View menu would not update in the other documents. Fixed. Fixed an issue that caused Pixelmator Pro quit unexpectedly when opening certain SVG files. On rare occasions, painting with Pixelmator Pro for extended periods of time would cause the app to quit unexpectedly. Fixed. Clicking the Show Original button when using the Color Adjustments or Effects would sometimes cause Pixelmator Pro to become unresponsive. Fixed. Painting on a layer mask with adjustments and effects applied would cause Pixelmator Pro to stop responding. Fixed. On rare occasions, Pixelmator Pro would stop responding while drawing or editing shapes. Fixed. Attempting to open unsupported Photoshop documents would cause Pixelmator Pro to quit unexpectedly. Fixed. Attempting to open certain RAW files not supported by macOS would sometimes cause Pixelmator Pro to quit unexpectedly. Fixed. Attempting to open PXD and PXM files with missing data would cause Pixelmator Pro to quit unexpectedly. Fixed. Think you’ve found a bug? Let us know at support@pixelmator.com and we’ll fix it!